Design your own personalized coin purse using your favorite photos and memories. Available in a choice of three sizes, your personalized leather coin purse comes with a choice of two different types of leather as well as a leatherette. Our 100% Italian Nappa leather is available in either smooth, which has a flat face or textured with a 'Bison' stamped surface. If you would like a vegan-friendly alternatively take a look at the textured, warm faux leather option. Accessories your way with a personalized coin purse, made to order by hand. With a personalized leather coin purse, you can use your photos and memories to create the perfect women's accessory. In a choice of three sizes as well as three different materials, you can create a perfectly personalized leather coin purse or a vegan-friendly alternative. Print on both the front and back, which you can design individually, giving you the option to feature a different design on each side. Knowing what it wants, which is as little product on it’s all natural body as possible, simply wipe down and leave flat to dry, a low maintenance companion, no fuss required. Our printing technicians use a state-of-the-art printing technique which has been specifically developed for printing onto leather. 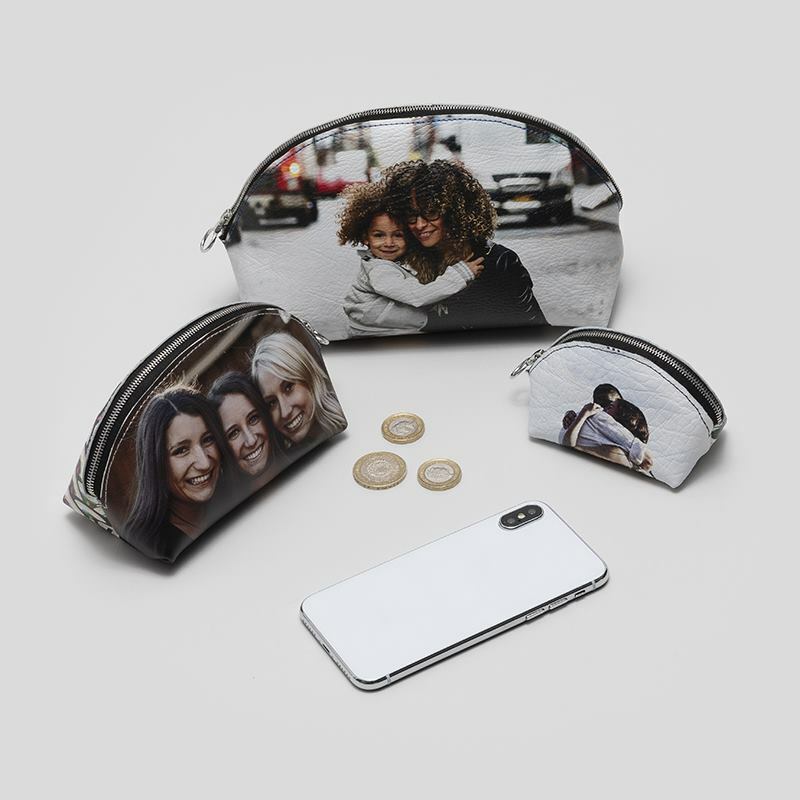 They will print your photos onto the material for your personalized coin purse, resulting in a high-quality, vibrant print which is long-lasting, and as strong as the leather itself. Your personalized leather coin purse is then cut to size by skilled craftsmen and hand stitched by our expert seamstresses. All this before being fully quality checked in our specialist department and being shipped out to you. You can print on both the front and the back of your personalized coin purse, and the best part is you can do so individually. This means that you can choose to have the same photo on both the front and back of your coin purse or a completely different one - if you prefer. If you can't decide on which photo - or photos - to use, you can create a picture collage using multiple images. Use one of our pre-set templates or design your own from scratch. You can even add text for names or initials, as well as repeat an image - great for faces and logos. Photo purse or mini make up bag. Ideal for most coins, phones and cameras too. Personalized with photo or text and makes a unique gift. Made from high-quality leather with several secure compartments, our Personalized zip top women's wallet makes the perfect gift.